We originally purchased our 2016 Club model ND Miata to manufacturer the best turbo systems that money could buy. First we set out by using the highest quality components, and designing everything to deliver not just the most peak power, but the widest power band possible. Secondly we designed everything to last in the long term, especially under track conditions with the highest level of stress. Lastly we wanted to prove this by testing our shop ND extremely thoroughly on both the dyno and track. We originally started off on E85 just for the extra level of safety while venturing into the unknown. Keep in mind at the time our shop car got up and running with the new turbo system, there was only 3 other known NDs with turbochargers, and everyone was having tuning issues. We set an early power level of 216rwhp/244rwtq on E85 in September. We then upgraded to a bigger map sensor and the OEM ecu did not like this with the Mazda Edit software. Matt from OrangeVirus Tuning discovered a work around for our previous throttle limitations on the ECUTEK ecu, so we switched back to the ECUTEK. It was now winter time, and the E85 winter blend was now E50. 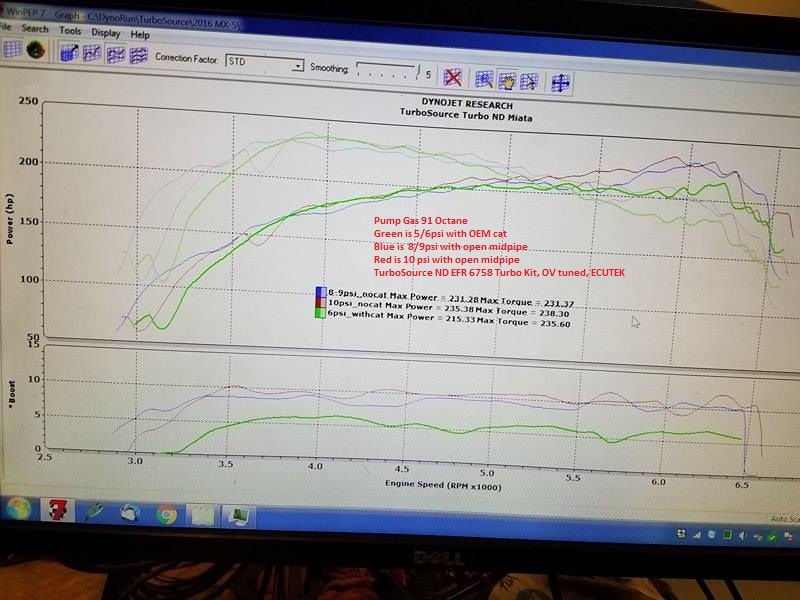 After a few more dyno sessions, and more ecu updates from Matt, we turned the boost pressure up to 13.5 psi and laid down 259rwhp/291rwtq( current rwhp/rwtq Skyactive record). The above power level was achieved on the OEM engine, clutch, drive-train and fuel system. The only modifications are our EFR turbo system with the 6758 option, a 3" open catback that we made in house, and an ECUTEK ecu with the OVtune. The above dyno is on the OEM midpipe with the OEM catalytic convert too. The engine made an impressive 210rwhp/233rwtq at only 3.5PSI with zero knock on all cylinders. This set a new record for most torque on pump gas and we were just getting started. 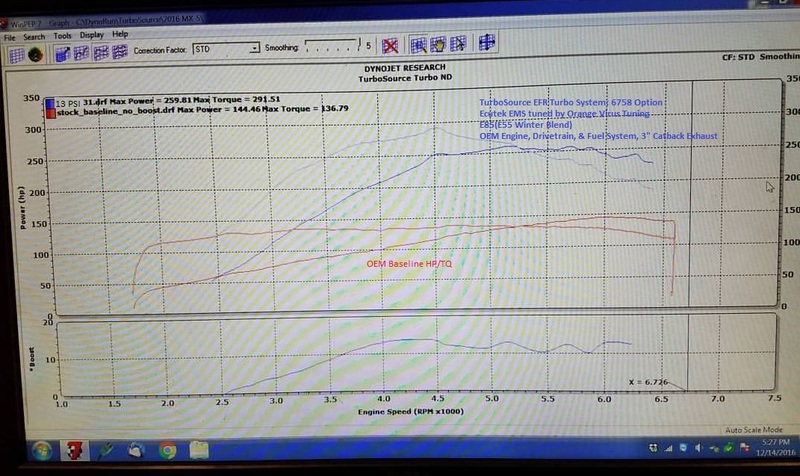 We started to turn up the boost, and dialed the car in at 5/6psi making 215rwhp/235rwtq. Not really much of gain in terms of power going from 3.5 to 5/6psi which we assume is from the OEM cam/head combination. We decided to try removing the OEM midpipe/cat and see how much that was restricting the engine. Boost pressure instantly jumped to 8/9 psi, even with the controller off. Now that the engine could breath it was starting to overwhelm the wastegate with the colder winter temperatures. Power from 4500+ rmps instantly jumped a substantial amount. Not all of this was due to the increased boost pressure, but the fact the engine does not have to work so hard to evacuate the exhaust. We tried raising the boost pressure to 10 psi to see if that would make any difference, and it only picked up 4rwhp, and 7rwtq. Again this points to the cylinder head just now flowing well in the high rpms. 235rwhp/238rwtq is now the new world record for most HP, and TQ on pump gas for the skyactive ND miata. This jump in power really makes us curious to see how much power it will make with a " race " midpipe at the 13psi setting on flex fuel. Here is the video of the above dyno runs; TurboSource Turbo ND Miata Pump Gas Dyno . We are planning on doing a set of cams, and some head work after this race season. Subscribed to our you tube channel for an upcoming drone and POV video of the 13 PSI flex fuel setting.